This last month you may have noticed that we had a new member join the International Needs UK team. His name is Walter – he is bright yellow and has a great personality. He is also really passionate about helping us raise money for our Water Projects (and he’s very good at it!). If you’re on our mailing list or follow us on Facebook, you might already know the twist to this story… that Walter is a rubber duck. But that’s not to say he isn’t a talented fundraiser; with your support, Walter has raised an incredible £4,100 in the last three weeks alone! On #GivingTuesday he went on a long journey around our office building and raised an incredible £2,370 in just one day! 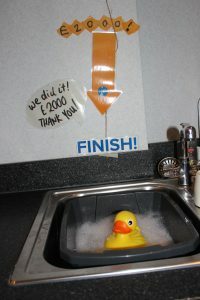 With every £10 donation made, he took another waddle-step along, making his way to our kitchen sink at the £2,000 mark. He then joined us at our Christmas Concert with IDMC and did it again, raising £1,730.75! We can’t give all the credit to Walter though, without your generous support we couldn’t have achieved such success. On Thursday 28th November this year, International Needs UK was an official partner, for the second time, in #GivingTuesday; the annual “day to do good stuff for charity”. Since it began in 2014, #GivingTuesday has become a global movement that millions of people across 70 countries have taken part in. “This year was my first time being involved with the INUK #GivingTuesday campaign, and it was certainly memorable. 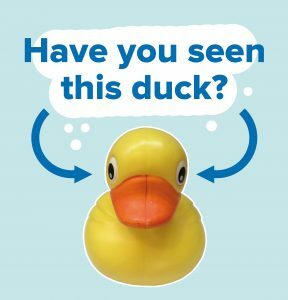 Not many people come home from work and say that they spent the day keeping tabs on a rubber duck! We spent Monday setting up the route around the building, preparing posters and receiving intrigued comments (and some odd looks) from other office workers. We went home feeling encouraged; we had already made progress to target as Croudace Homes agreed to donate £500!” – Katie, INUK communications. Throughout Tuesday, every donation got us more excited and had us running up and down the stairs to help Walter waddle his way along the route. 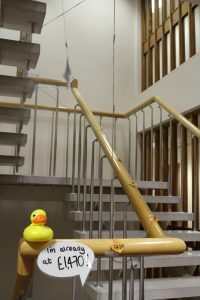 By 7:00 pm Walter had waddled over 3 floors of the building, had a ride in the lift AND raised £1,600! But your generosity did not stop there! By 9:30 pm our total had reached an amazing £2,370; enough to provide 600 people with sustainable access to clean water, and all in one day! Projects will have a real impact on the families we work with. Walter went on a long journey to reach water, just as millions around the world do every day. Women and Children around Buikwe Uganda often spend hours each day, walking long distances to collect water. This takes away from time that could be spent building a livelihood or spent in school. Through the funds raised by Walter, we can continue to help families and communities overcome the burden of the walk for water. We look forward to updating you on the progress we make with the donations made over the last month.